There are different ways of cupboard construction. below I have explained pros and cons of the both cupboards. go through this choose your option. 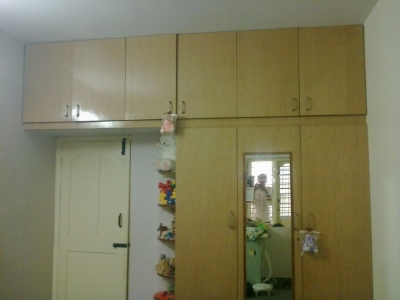 Cost effective – Usually cupboard will be of length 7 feet. Since bricks will cost less than wood, this method will be cost-effective. Less work – If you are constructing with brick Meastri will construct this. There won’t be any extra charge for this from his side. Occupies more space and bulky – Since you will be using bricks at least it will come to 4”. You can construct by using half brick even though after plastering it will come to 3”. Second option will be good but it will take some more time of Meastri. Meastri has to construct cupboard in two stretches. Occupies less space – If you are using wood material you need to use plywood sheets for this. Usually this will be 3/4” or 1” thick. It will not occupies your room space. More cost- Since plywood cost Rs 40- Rs 60 so your material cost will go up and carpenter will charge will extra for this option. Place can be changed – If you make box type cubboard you can move it to one place to another place. These will be best suited to small rooms. 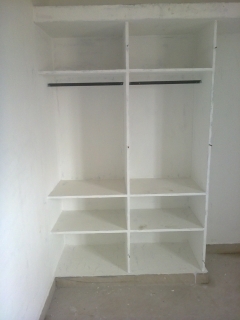 Below picture shows cupboard constructed with mesh and cement. Bolts will be left outside to fix wood doors. Look wise it will be nice and it is strong also.